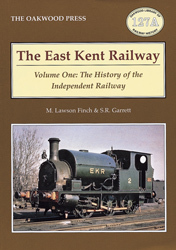 It must be said that, for the light railway enthusiast and to the many who finds pleasure in the unusual or eccentric, the East Kent Railway was a delight. For many it was a last link with the disappearing relics of a bygone age; an age of benevolent gentry in high wing collars and drooping moustaches, each and every one of whom was endowed with the capacity, obvious from the straining buttons on their waistcoats, for enjoying numerous celebratory luncheons. It was an age when ordinary people were much nearer to nature than they are today and if it was a beautiful day everyone knew it and the guard would most likely comment upon it. It was also an age when individual contribution seemed to count for something – if the carpenter-painter put the wrong markings on a carriage door it remained good subject of conversation for a lifetime. For many the passing of the ‘East Kent Light’ has closed forever the door to a retreat where, for a shilling or so, one could shed many burdens and return fortified against the tedium of modern existence. Without such sanctuaries many of us are lost indeed. A5 format, 232 pages, 110 illustrations.